Welcome visitors from Pinterest. Thanks so much for clicking through! Click here —-> YouTube <—- to subscribe to my painting and drawing tutorial channel on Youtube. Its full of tips for your drawing and painting skills. Your support means the world to me. 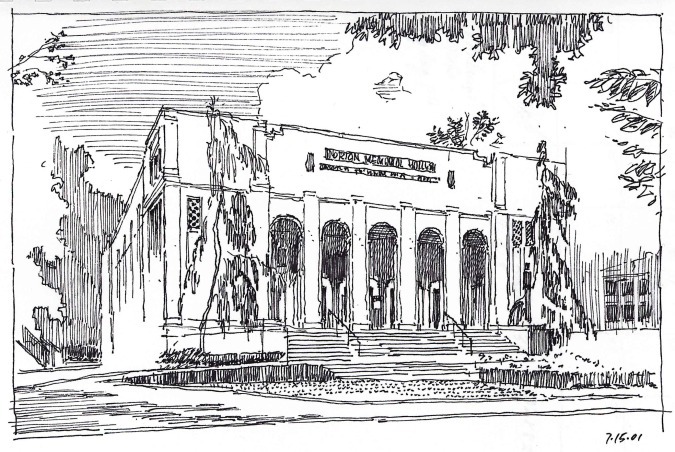 Pen and ink is the youngest Kardashian sister of architectural rendering techniques: she's the most beautiful, but the one you're least likely to know how she'll turn out. Pen and ink is a bit of a high wire act for obvious reasons: you can't erase. On the other hand, there is nothing so rewarding as sitting for 45 minutes in a beautiful place and producing a classic looking pen and ink sketch, and this tutorial will show you some tricks for how to do it. 1) limit your subject matter to something you can capture in 45 minutes. 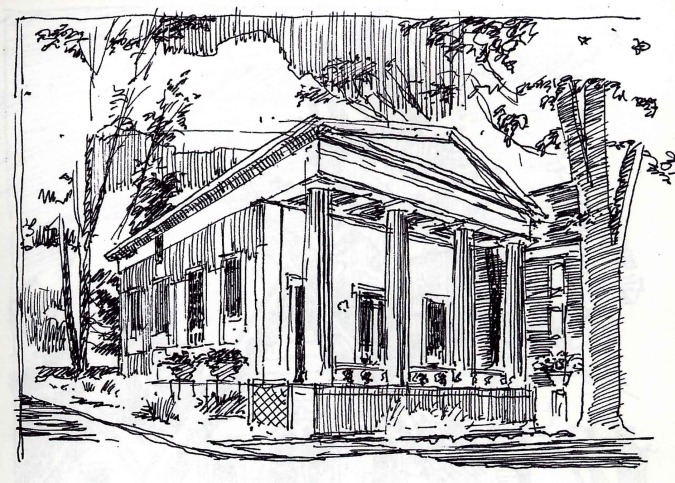 I made the pen and ink sketches below while traveling, finding a simple subject and sticking to it until I was done. 2) use pencil to compose the sketch. You will erase it later so don't worry about being called out. 3) have a plan for lights and darks. These will animate your composition, and so this is the trick that seems most like hard work. 4) model the three-dimensional planes of your composition with the direction of the strokes and hatchmarks you use to create those lights and darks. 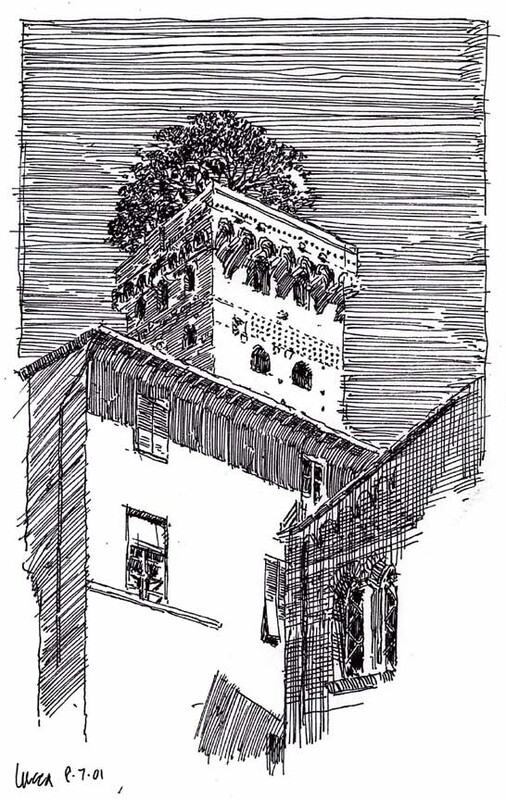 (Note the difference between the strokes used for water and the strokes used for the poplar trees in the sketch above) When you study the work of the masters, this is one of the most astonishing aspects of their technique: the diversity and density of their hatch work. 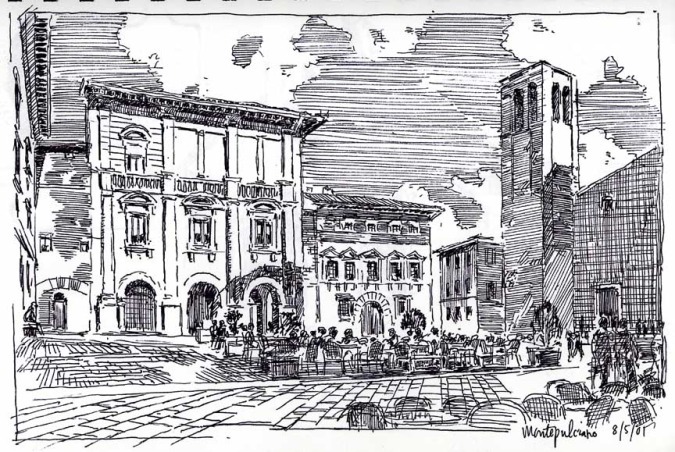 Pen and ink sketch made in San Gimigniano, Italy by James Akers, a licensed architect and architectural renderer based in New York City. Look closely: weren't you the person at the last cafe table? 5) don't worry about sucking. This should really be the golden rule. Maybe even one of the 10 Commandments. Thou shalt never fear sucking, because that fear will prevent you from trying something new. For what is art if not something new? If you needed any more proof, this is it: that little sketch you just sat down to make? No one has ever made it before. Please leave your comments below and call or email anytime to swap tips. All the best, and don't forget to connect with us on Facebook, Tumblr, and LinkedIn. That way you'll be sure to have access to our entire ongoing series of architectural rendering techniques and tutorials. Ciao!